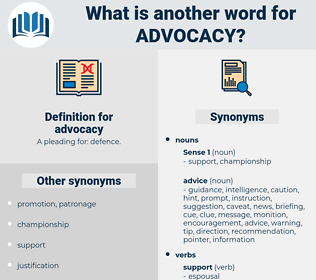 What is another word for advocacy? Rights, Opportunities, groups, media, forces, Programs. apologia, consciousness-raising, campaigning, sensibilisation, militancy. Propagated, publicised, Pioneered, initiated, proposed, Began, extended. 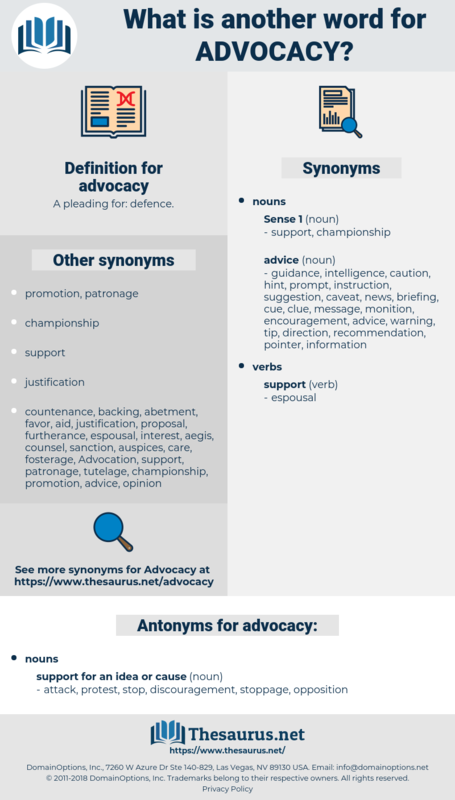 Lawyers, advocates, promotions, outreach, awareness, Advocating. furtherance, glorification, outreach, awareness, Advocating. attack, protest, stop, discouragement, stoppage, opposition. It characterized the advocacy of the aims of the deputation by the Brotherhood as " Rubbish - a commodity which can always be picked up, and quite a lot of people spend much of their time in collecting it." He also began to write, in picturesque advocacy of his views, for serious weekly and monthly publications. adiposis, at peace, adipose, advise, adobe house, advisee, autopsy, autobus, autofocus, advice, autotypic, adps.